Like most genealogists, reader Bill Smith is very conscious of the value of maps in his research. But, it occurred to him, there could be issues with using one particular type of map. He wants to use Google Maps to locate small towns and hamlets where his ancestors have lived and his family members now are living. Great question. And The Legal Genealogist is delighted to see that so many people are now stopping to think about the legal issues before they use something — rather than paying the price afterwards. The answer is that Bill is perfectly free to use maps from Google Maps (the online map service accessed at https://maps.google.com/) or Google Earth (the software downloadable at http://www.google.com/earth/index.html) for his purposes– as long as he follows some basic rules. And we can only wish that Google made it a bit easier to find that out. Reading that, most people might come away thinking that even a single image being used in a genealogy report shared with a family member might violate the rules. Not so, as Google makes clear — but not there. There’s a whole separate page of Permission Guidelines for Google Maps and Google Earth. And in the “Frequently Asked Questions” there, you’ll find clearer — and more favorable — answers. That separate page provides the “prior written authorization from Google” that you need for the uses explained there. 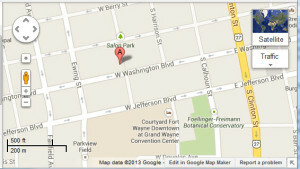 That’s where you’ll find, for example, that you’re perfectly free to use individual images from Google Maps/Earth on your website, perhaps to illustrate a blog post just as the image above (of the location of the Allen County Public Library, site of so many of this week’s activities for the Federation of Genealogical Societies conference) is being used here. And in printed projects like genealogy reports, in genealogy presentations, and in more. There are other limits spelled out on Google’s permissions page — you can’t create your own map by tracing a Google Map, for example. So anybody who wants to use images from Google Maps or Google Earth should read through the limits carefully. Great article as usual. One question, when it comes to altering. 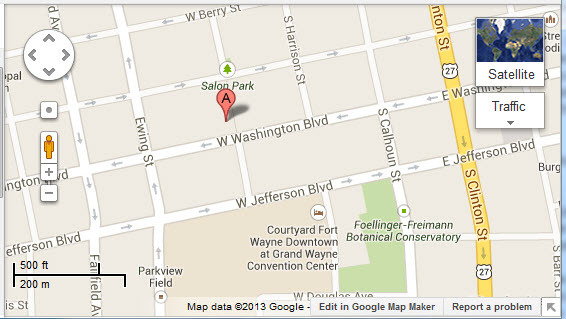 I’ve been known to put an arrow on top of the image from google maps. Is that considered altering? I know they say no clouds. Anyway, great information that a lot of us will be able to use. Anne, it’s literally inconceivable to me that that would be considered “altering” the image — you’re just highlighting something by pointing to it, and just as Google Earth has built-in placemarks, polygons and overlays to focus on something, an arrow just does the same thing. Now maybe Google would see it differently — but I can’t imagine that it would. Thanks Judy. That is what I would think as well. But I’m guessing I wasn’t the only one who does that or had the question. Thanks for the article. Glad I could help, Anne! Sure… if that happens to be something you have access to and fits your needs. Judy, I appreciate your willingness and ability to explain these things to the rest of us. Thank you! Just to be clear, may I use an image of a Google map (with the necessary attributions) in a report that I prepare for a client who has paid me for the said report? I am not selling the image, I am merely using it to illustrate a location, etc. so it would seem to me that I would be safe to do so, but I do NOT want to get cross-wise of Google. Kate, the permission page expressly says: “You may use our maps in internal reports, presentations, proposals, and other related professional documents. We request you still retain attribution to both Google and our data providers.” A client report, it seems to me, is certainly a “related professional document” and far more private than a presentation or a proposal. Moreover, you can even use the maps in advertising: “No explicit permission is required for your ad project.” Given those permissions, it’s inconceivable to me that using it the way you suggest in a client report would be anything other than just dandy by Google. I suspect their biggest concern is people “modifying” the copyright and credit information off the images, Judy! So a “don’t modify at all” rule sure solves that. Thanks so much for interpreting the legal-ese for us non-lawyer types! So… if I use images from Google Maps Street View to illustrate a book about historic houses, to show what they look like “today” — as long as I attribute “All photos courtesy of Google” is that sufficient? Or should each photo carry a credit line that says: “Photo credit: Google Maps Street View”– is that better? And once attribution is clear, can my local historic society then sell printed copies of the book to cover printing cost? Thank you so much for your translation of the legal ramifications of using Google Maps. I am producing flight training instructional videos for sale. I would like to use three map pictures from Google Maps for the project. the maps are of an airport. I want reflect the traffic pattern for landing in the form of a rectangle super imposed on the map. is that allowed by Google. I really appreciate your time and thank you in advance for it. You will have to pose your specific question to Google or to your own lawyer. I don’t give legal advice at all — see Reprise: Rules of my road). I have emailed them this specific request and received no answer, so I’ll ask it here. Even following all the required attributions, can I use three copied maps in an eBook for sale to illustrate the location where included photographs were taken? An advertisement is a commercial endeavor, as is a movie or television, but then so is a mug and a beach towel. They discuss print projects, but not eBooks, and they don’t specify whether for sale or not – at least not that I could find. I can apparently download a Widget that will allow me to launch Google Maps from within my book, and take the reader to the specific map I want as well. Color me confused! Thank you. Ray, the only folks who can tell you what Google means when it says commercial use are the folks at Google. I wish I could do better, but it’s their circus, their monkeys, and the only information you can rely on to make a business decision has to come from them. Im a football historian author. I have created a vast database on my computer of Google Earth locations where football grounds USED TO exists. I mark the exact spot using Google tools to produce a rectangle overlaid so people can see where they used to be and what’s there now. Can I use perhaps ten such images in my next 300 page book, giving all and any accreditation that Google requires ? First of all, make sure the map retains the Google Earth information (the logo and copyright info in the corner must not be deleted). Then construct a citation that says how and when the map was created. The same as you would cite anything you use. Can a Google Map be used in an Higher Ed educational book from a major publisher as long as it credits the source as Google maps? Can i Record google street view map on my android and post them on youtube channel so that people can find those place easily??? You’ll have to carefully review the terms of service to see whether your proposed use is covered, and ask them if you aren’t sure. What if created a tour or movie using Google Earth Pro? I would also be adding photos to the tour/movie and personalizing it to fit my project and I don’t mean by altering the basics of the map. I would be adding locations and photo specific to that location and attributing those accordingly. So if I’m using Google Earth Pro, can I sell access or the file of the tour/movie assuming everything is attributed correctly?